For the 27,000 Druze residents of the Golan who have been offered citizenship in the only democracy in the Middle East, the Syrian alternative has never looked more absurd than it does today. 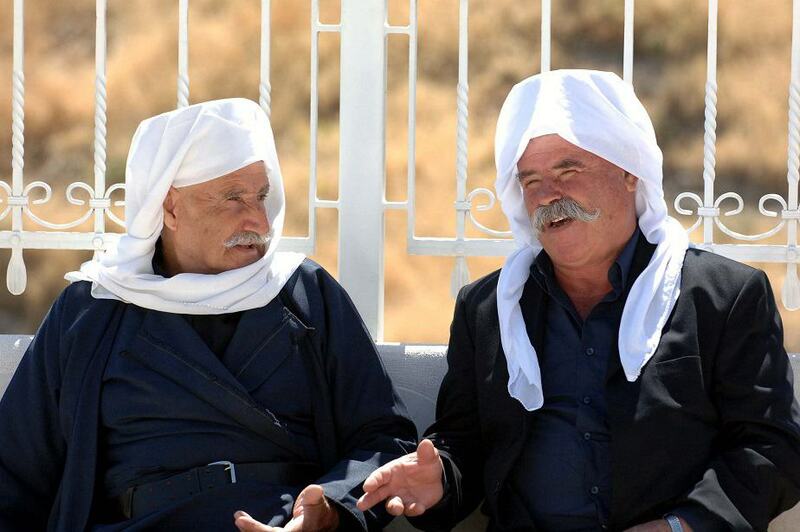 Approximately 27,000 Druze are living in the Golan today, in four communities in northern Golan: Mas’ade, Majdal Shams, Buq’ata and Ein Quniyye. Israel’s occupation of the Golan in 1967 included accepting responsibility and governance over the Druze population living in the northern region of the Golan. Upon the application of Israeli law in the Golan, Israel offered the Druze the possibility of becoming Israeli citizens with equal rights and Israeli identity cards. The Druze received this proposal with mixed feelings – between their desire to be loyal citizens of Israel and enjoy equal civil rights as is customary in Israel, and their fear that, in the scenario of Israeli withdrawal from the Golan, the Syrian regime is liable to persecute them for their disloyalty. During the initial years of the Israeli presence in the Golan Heights, Israel invested massively in developing infrastructure, building communities, establishing industrial plants and creating jobs and constructing public buildings and educational, religious and cultural institutions. This development momentum also encompassed the Druze communities, who benefitted from the development of infrastructure, improvement in their quality of life and advancement from living in a “developing country” to living in a “developed country.” However, the Druze population of the Golan have been observing the conduct of the State of Israel over the years and its vacillations about remaining in the Golan Heights, so their concerns about becoming Israeli citizens are understandable. Israel’s willingness to pull back from the Golan Heights and the absence of any long-range policy for establishing Israeli sovereignty over the Golan do not offer any incentive – to put it mildly – for the Druze residents of the Golan Heights to reach a decision to join Israeli society. The Israeli government’s willingness to withdraw from the Golan Heights, and the fact that segments of the Israeli public advocated withdrawal at various times, heightened the Druze community’s perception of Israeli rule over the Golan as being tentative which, in turn, heightened their fear of retaliatory actions by the Syrian regime the day after Israel withdraws from the Golan. 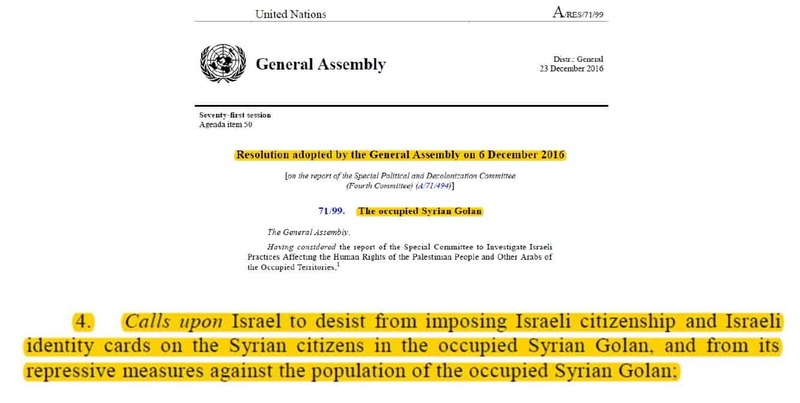 This reality not only made it impossible for the Druze of the Golan to publicly support Israel, but also compelled them to demonstrate active opposition to the continuation of Israeli rule – most of the Druze living in the Golan Heights have relatives living in Syria; therefore, any open support of Israel and lack of support of Syria could also jeopardize the lives of their Syrian relatives. In recent years, a reversal in trend began emerging among the Druze population of the Golan. The civil war in Syria triggered a sharp rise in the number of Druze residents of the Golan who applied for Israeli citizenship. Data from the State of Israel’s population and immigration registry show that, in 2010, only two Druze became Israeli citizens; in 2015, there was a sharp rise in the number of citizen applications, reaching an estimated one hundred new citizen applications. From January to June 2016, 83 Druze residents of the Golan completed the Israeli citizenship process. Although at issue is a small percentage of the Druze population in the Golan, one cannot ignore the emerging trend. It is important to note that Israel has a strategic interest in encouraging and expanding this trend. The existence of a relatively small Druze population and the fact that Israel is prepared to grant full Israeli citizenship and full equal rights to Druze residents of the Golan are the key factors that differentiate between the discussions about the Golan Heights and the discussions that have been underway over the last half-century about the impacts of the Israeli presence of Judea and Samaria and its implications for the local population and Israeli society. Israeli sovereignty over the Golan Heights does not involve “control over another people,” and the discourse about human rights, which is a key issue with regard to Judea and Samaria, is irrelevant to the issue of the Golan. Syria – insofar as it might continue to exist as a one State – will not be as it once was. For the 27,000 Druze residents of the Golan who have been offered citizenship in the only democracy in the Middle East, the Syrian alternative has never looked more absurd than it does today.